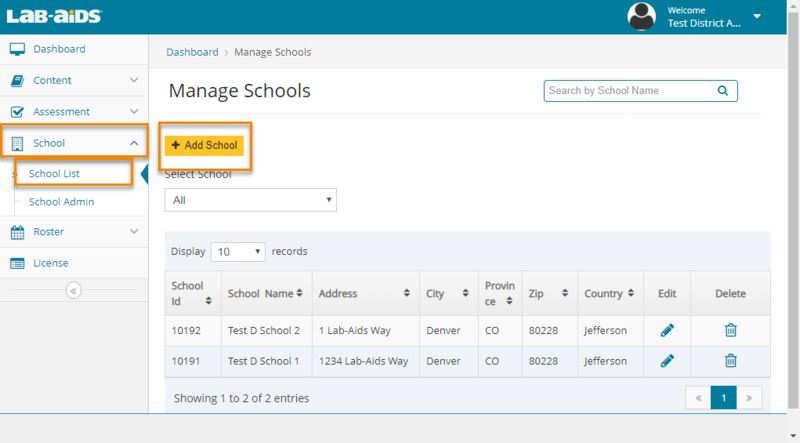 After logging in as district admin, click the "School" link on the left menu, then click "School List." Click "Add School." Enter in all details and click "Save." Repeat for all schools that need access to Lab-Aids content. Note: You (district admin) can serve as each school's admin, or you can assign each school's admin role to someone at the school level. One school admin needs to be added for each school. If you choose to add yourself as the admin for each school, you'll need to use a separate username (email address) for each admin account. 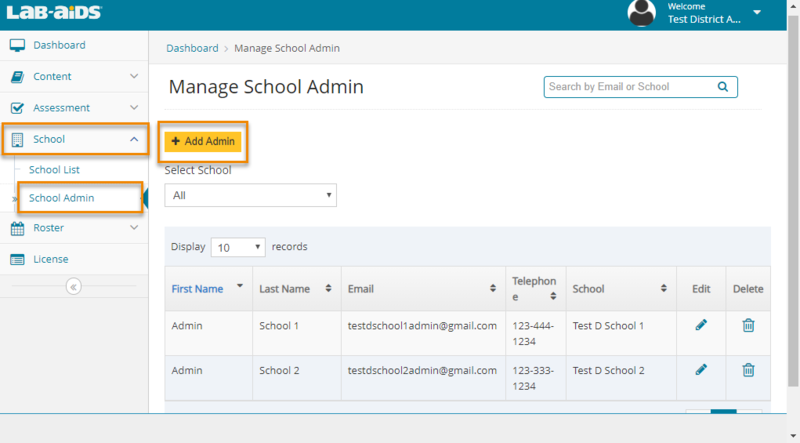 After logging in as the district admin, click the "School" link on the left-hand side menu, then click "School Admin." Click "Add Admin." Enter in all details, then click "Save." You'll need to do this for each PO issued to your district. Click on "License" on the left-hand side menu. You'll see a list of all POs that have been assigned to your district. 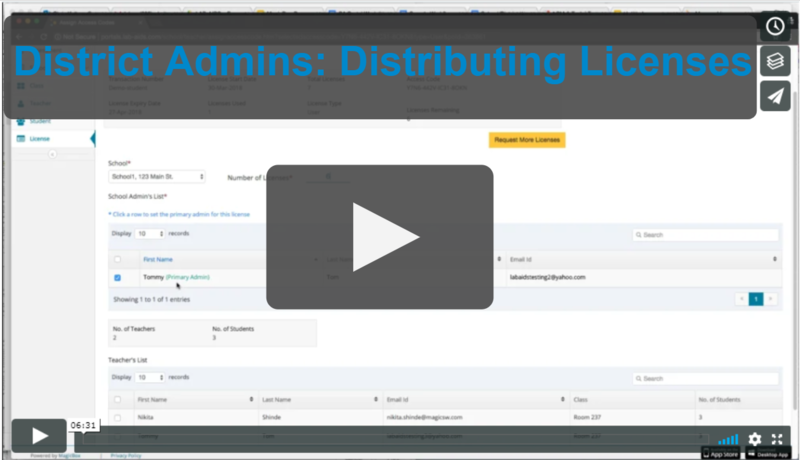 (A PO is a set of licenses issued to your school/district). Click the "Assign" icon to the right of the PO. 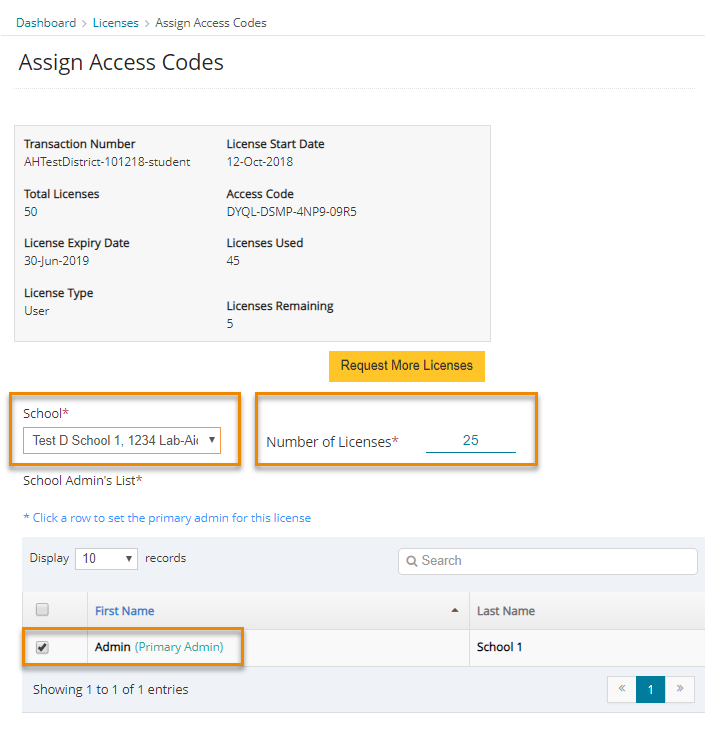 Select a school from the dropdown menu and enter the number of licenses you would like to issue to that school. Make sure the school admin is selected. If the PO is for students, make sure number of licenses assigned includes the number of teachers + students + admin(s). 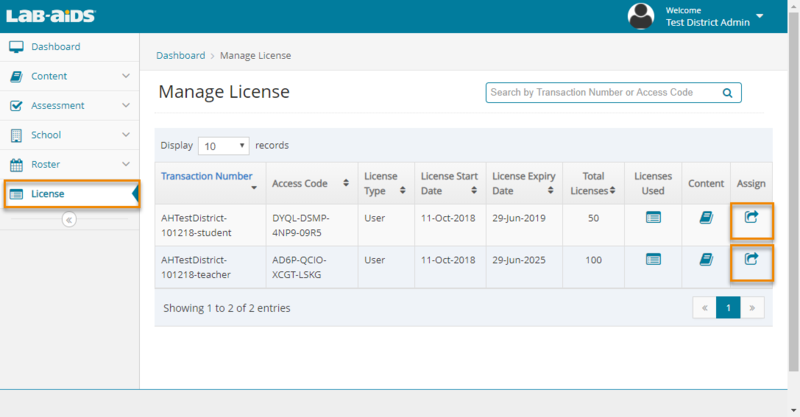 If the PO is just for teachers, make sure the number of licenses assigned includes the number of teachers plus admin(s). Optional: If you are also acting as the school admin, you can select the teachers who should be assigned the PO. Then, repeat for all POs assigned to your district. 4. Once you have completed the above district admin duties, the school admin setup duties will need to be completed for each school. Either the district admin or the school admin can complete these duties. Schools/Teachers need to be assigned both the teacher POs and the student POs. If you only have one PO, that's fine. When assigning the student PO to schools, make sure that you assign enough licenses to cover the admin, teachers, and students. You do not need to assign anything to students. Teachers will assign content to students.